As the Midwest continues to brace for the flooding of rivers swollen by record amounts of snow and rain, Mississippi River floodwaters are slowly receding. 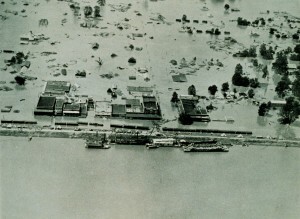 The April and May floods along the Mississippi, America’s longest river, affected communities in Illinois, Missouri, Kentucky, Tennessee, Arkansas, Mississippi, and Louisiana, forcing the evacuation of thousands of homes. 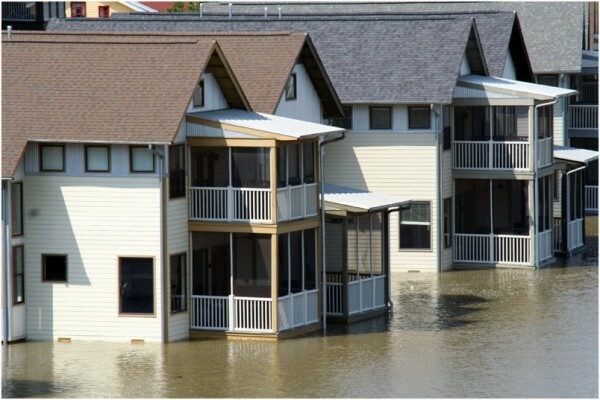 As destructive as the historic floods of 1927 and 1993, the 2011 Mississippi River floods, could result in damages worth billions of dollars. Over time, the U.S. Army Corps of Engineers (USACE), the federal engineering and construction agency, has spent more than $123 billion on flood control infrastructure that hasn’t always adequately protected us. Now some are calling for a new approach to flood control that makes room for our rivers. Over 70 million people reside in the Mississippi River Basin, with 12 million people making their home along the river itself. 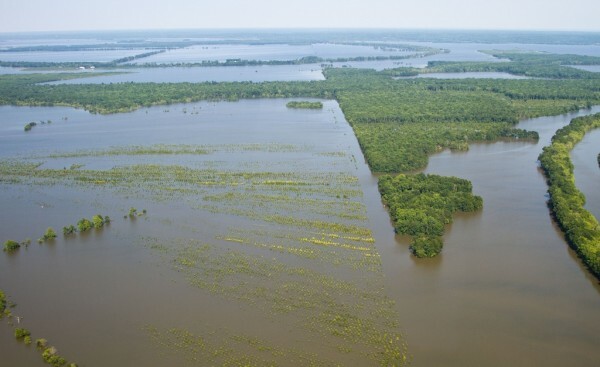 Before the area was settled, the Mississippi ran wild, flowing through side channels and around hundreds of islands, and often flooding nearby lowlands or floodplains (level land near rivers that are periodically submerged by floodwaters). As more people moved west and the Mississippi became an important navigation channel for larger boats, the USACE built 27 locks and dams between Minneapolis and St. Louis that altered the river’s natural flow. After the great flood of 1927, there was a call for a comprehensive system of public works along the Lower Mississippi that would provide flood protection and maintain the navigation channel. 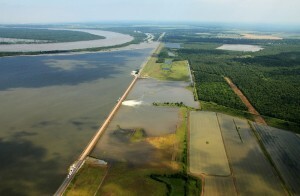 The USACE constructed levees and floodwalls from Commerce, MO to New Orleans that further changed the river’s flow. American Rivers recently named the Mississippi one of America’s Most Endangered Rivers for 2011 because of the catastrophic flooding, criticizing what it called “outdated flood management strategies and over-reliance on levees that have contributed to the record flood damage.” While they make sense in populated areas, levees and floodwalls decrease the risk of small floods, but increase the risks of big ones by narrowing the channels of rivers, forcing the water to rise higher and flow faster. In addition, levees cut rivers off from their floodplains, destroying wetlands that provide natural protection from floods. In the Upper Mississippi Basin, 35 million acres of wetlands, equivalent to the size of Illinois, have been destroyed. The presence of levees and the availability of flood insurance have also given people a dangerously false sense of security, allowing them to settle and develop right next to rivers on lands that were once floodplains. 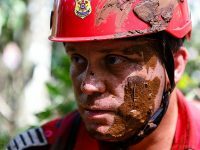 It’s also clear that climate change, with its extreme and unpredictable precipitation events, is already exacerbating flood risk, and conditions will only worsen in the future. According to America’s Rivers’ new Weathering Change report, until now the USACE has not been required to consider climate change in the siting or planning of its projects. But “With shrinking budgets and growing water challenges, we can’t afford to waste money on infrastructure that won’t work,” said Andrew Fahlund, American Rivers’ Senior Vice President for Conservation. Organizations like American Rivers are advocating for a more natural flood control approach that would let rivers follow their natural channels and periodically spread into floodplains, and protect and restore wetlands. An acre of wetland, saturated with water 1-foot deep, can hold 330,000 gallons of water, equivalent to the amount that would flood 13 homes thigh-high. Wetlands also filter and purify water, and provide habitat for wildlife. In cities, green infrastructure like green roofs, porous pavement, and plantings can help stem flooding as well by reducing runoff. The Dutch began building dikes and levees to control flooding 800 years ago, because 25% of The Netherlands is below sea level and 25% more is subject to flooding. But the 1993 and 1995 floods, which resulted in $300 million worth of damage and the evacuation of 250,000 people, spurred a reassessment of flood control strategies. 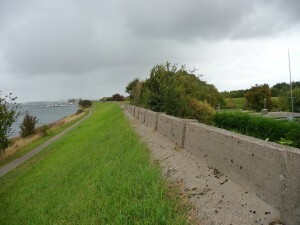 Whereas the Dutch would once have responded to flooding by building their dikes higher, in the late 1990s they realized that flood risks were only going to intensify with climate change. In 2007 the Dutch government approved a new $3.3 billion strategy for dealing with flood threats called Room for the River. Room for the River will reduce high water levels in the Rhine, Meuse, Waal and Ijssel Rivers. By 2015, these rivers will be given more room at 39 locations, using a variety of strategies clearly illustrated in this promo video. The strategies are: relocating dikes further inland to widen floodplains, modifying dikes in certain areas to allow for flooding, lowering floodplains because accumulated sediments have made them shallower, reducing the height of groynes (rigid structures placed in rivers to slow the water flow) to allow water to flow more quickly, creating side channels as alternate routes for high water, deepening the river bed, removing obstacles from the river that obstruct flow, and creating temporary water storage areas. 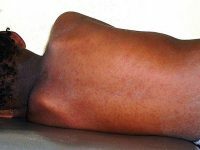 In places where it’s not possible to create room for the river, dikes may be heightened and strengthened, though incidences of dike slumping and land subsidence will likely increase if dikes are made taller and thus heavier. Currently, the Rhine River can cope with 15,000 cubic meters of water per second without flooding. By 2015, it will be able to cope with 16,000 cubic meters per second. 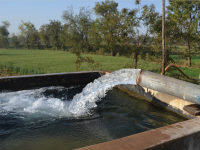 If Room for the River proves cost effective, additional measures may be planned to raise the river’s carrying capacity to 18,000 cubic meters per second by 2050. Room for the River, which will also improve the environmental quality of river areas, will eliminate 3163 acres of agricultural land and increase natural land by 4576 acres. Dutch ambassador to the U.S. Renee Jones-Bos, explained that two corollary policies will complement Room for the River. “Retain, Store, Drain” will encourage communities to harvest and store water with cisterns, green roofs and floodable parks; and “Living With Water” will promote communities that value and adapt to water instead of fearing it. In the U.S., change is coming too. Louisiana’s Senator Mary Landrieu recently took a group of government leaders and educators to The Netherlands to learn about Dutch water management practices. And more importantly, Congress, which authorizes the USACE’s public works projects through periodic passage of Water Resources Development Act legislation called for new Principles and Guidelines (P&G) for all federal water resource projects, which the Obama administration is currently crafting. The new standards must protect the environment by maximizing sustainable economic development, avoiding the unwise use of flood plains, protecting and restoring the functions of natural systems, and also incorporating nonstructural strategies. Hopefully, they will also be required to take climate change into consideration. The new P&G, which haven’t been updated since 1983, are due out this year. In the meantime, some U.S. communities have already implemented their own Room for the River strategies to deal with flooding. The Iowa River Corridor Project, begun after a severe flood in 1993, compensates farmers who permanently stop farming fields in floodplains. Much of the 50,000 acres involved have reverted back into natural wetlands, grassland and bottomland forest, and provide habitat for wildlife. The Napa River in California often floods between November and April. The $400 million Napa River/Napa Creek Flood Control Project is lowering dikes, creating floodplains and a bypass, relocating bridges and restoring 900 acres of wetlands according to “living river” principles. Floodplain and wetlands restoration projects are also ongoing in Illinois, Massachusetts, Missouri, North Dakota, Minnesota, Oklahoma, and Wisconsin.